On the main A949 Evelix Road approach to Dornoch from the A9, at the junction with the B9168 Poles Road (OS Ref: NH 793 898) , stands the impressive Dornoch War Memorial. This well known Scottish memorial has the magnificent sculpture by Alexander Carrick of a 5th Seaforth Highlander c. 1916 at Beaumont Hamel looking south towards the battlefields. The square plinth has four memorial plaques, that on the front and the right and left side listing 69 servicemen killed in World War 1 and the plaque on the rear face bears as the first name Nursing Sister Lily Murray followed by the names of 31 servicemen who died in World War 2. 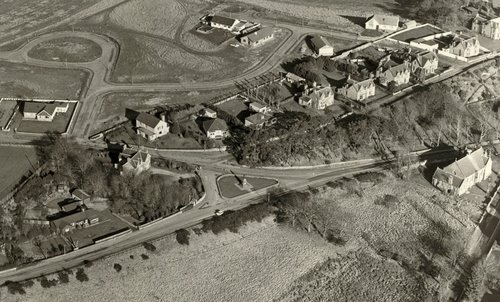 As a project for Scotland's 2009 Year of Homecoming, Historylinks Museum endeavoured to add personal detail to those from Dornoch Parish who died in World War 1 and 2. The detail obtained can be accessed from the Roll of Honour listings for World War 1 and 2. The memorial originally stood on an island at the centre of Poles Road junction and was moved to its present location in 1992. 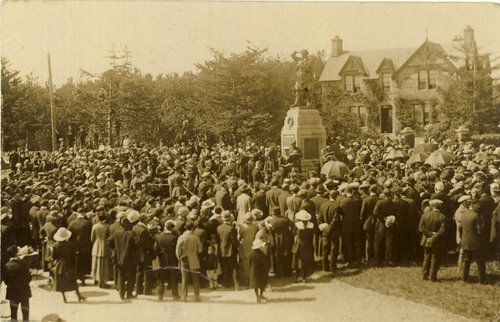 The inscription at the foot of the plinth is taken from an American Civil War poem: "ON FAME'S ETERNAL CAMPING GROUND THEIR SILENT TENTS ARE SPREAD AND GLORY GUARDS WITH SOLEMN ROUND THE BIVOUAC OF THE DEAD"
Dornoch was in the recruiting area of the 5th Seaforth Highlanders, with a great local affinity to this regiment. 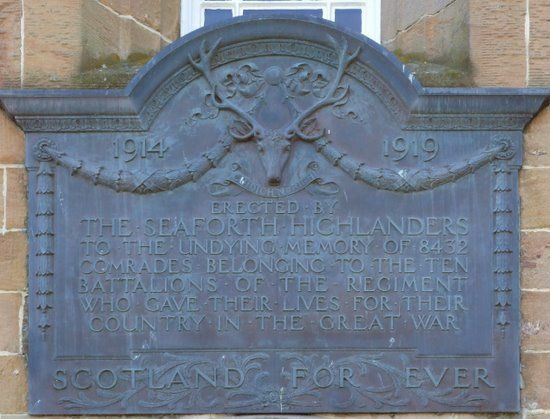 It is not surprising, therefore, that the plaque on the front face of the plinth is dedicated to those killed whilst serving in the 5th Seaforth Highlanders during World War 1, listed by rank and then in alphabetical order. 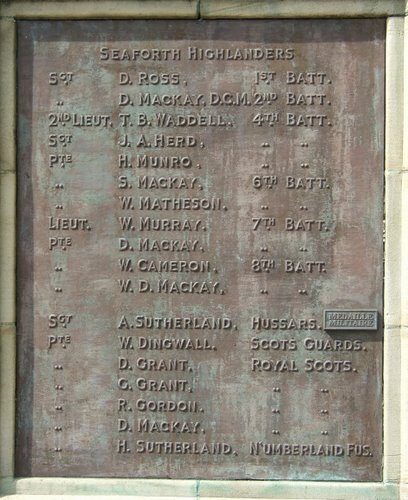 The plaque on the right side lists those killed serving in other battalions of the Seaforth Highlanders and other regiments, with the listing continued on the plaque on the left-hand side of the plinth. The total number listed for World War 1 is 69. There are some memorial errors in the ranks, units and the decorations for gallantry, with only one correction, the addition of a small plaque beside Sergeant A Sutherland, Hussars, recording his award of the French Medaille Militaire. The World War 1 lists include the Grant brothers (George and Richard), the three Herd brothers (James, John and William), the MacKay brothers (Donald and Simon), the Murray brothers (Alexander 'Alick' and Lieut William Murray) and the Ross brothers (David and Thomas). A brother and sister are listed, separated by the two World Wars; Cpl Angus Murray, Machine Gun Corps WW1 and Nursing Sister Lily Murray, Queen Alexandra's Imperial Military Nursing Service WW2. 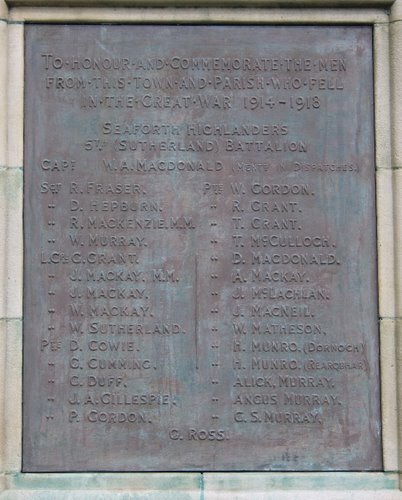 There are 69 WW1 servicemen listed on the Dornoch War Memorial. 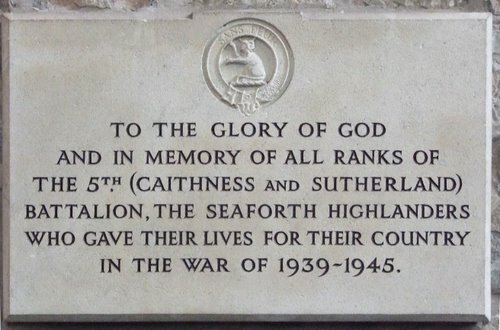 Additional names appear on local graves, family headstones (Capt James Giffen MC, Cameron Highlanders, Cpl Norman Irwin, 2nd Bn Canadian Volunteers, Deck Hand Alexander MacKay, RN Reserve, Capt Alexander Murray, Scottish Horse) and Dornoch Cathedral Rolls of Honour (Pte George MacKay, Pte George MacCulloch and Company Sergeant Major Alexander Neish). Personal details have been included in the museum consolidated Roll of Honour World War 1 which lists 77 names of all service personnel with a specific Dornoch connection who died in WW1 . 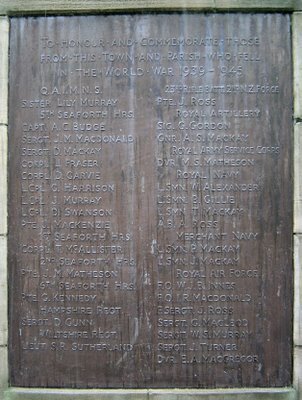 The Second World War plaque listing 32 names is on the rear face of the Dornoch War Memorial plinth. 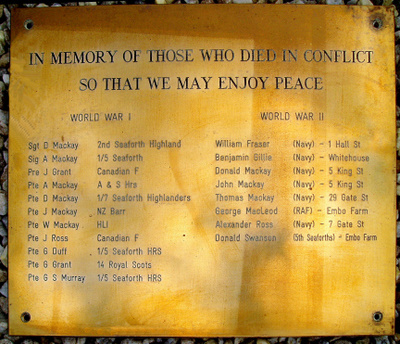 Three servicement killed in World War 2 (Sgt Donald Gunn RAF, Pte William Matheson, Seaforth Highlanders and Lt William Munro RAPC) are not listed on the memorial plaque. Their names and personal details have been included in the consolidated museum Roll of Honour World War 2. 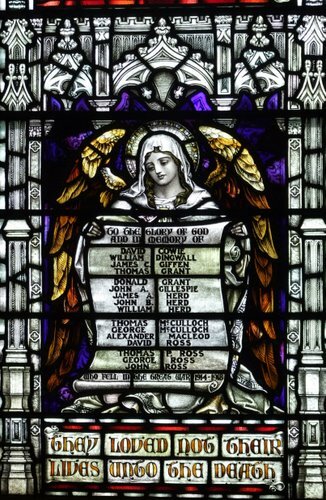 Dornoch Cathedral has several additional memorials including a stained glass window listing members of the congregation killed in World War 1 and a Congregation Roll of Honour listing all those who served, including those killed in WW1. 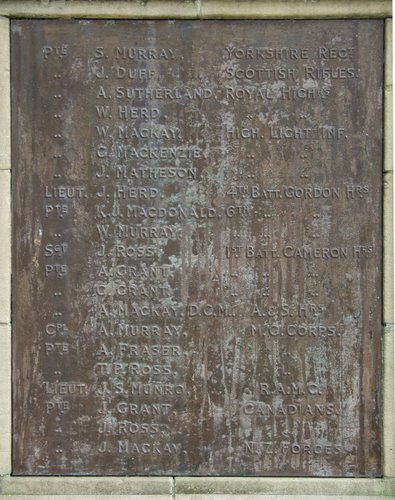 A brass wall plaque in Dornoch Cathedral commemorates members of the congregation of the Dornoch United Free Church who were killed in WW1. 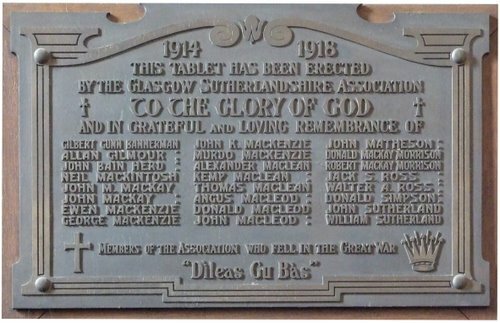 ...Members of the Association of the Glasgow Sutherland Association who fell in the Great War. Details of local burial, inclusion of an inscription on family headstones and all listing on local memorials, including the Dornoch War Memorial, have been included in the record for each individual serviceman and woman, which can be accessed from the WW1 and WW2 Rolls of Honour. Dornoch East Cemetery in Golf Road, Dornoch has Commonwealth War Graves Commission graves and some inscriptions to servicemen on family headstones. Proncynain Cemetery is located outside Dornoch on the B1968 Poles Road (OS Ref: NH 788 909). It contains three Commonwealth War Graves Commission headstones, two of Commonwealth servicemen, Naik (Cpl.) A. Rakhman and Dvr. N. Ghulan of the Royal Indian Army Service Corps and the grave of Pte. W. Matheson, 5th Seaforth Highlanders. 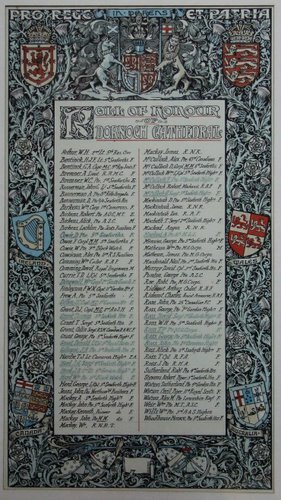 A Dornoch District Roll of Honour held by the museum (Catalogue number 2001.206) lists servicemen and women who served during the Great War. 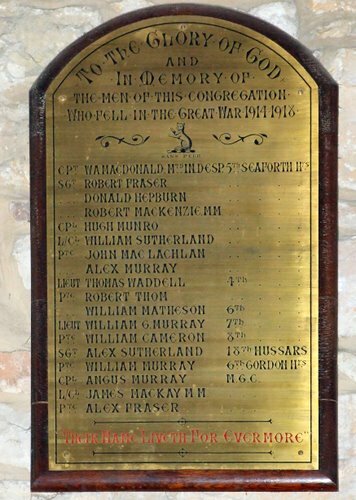 The Dornoch Cathedral Congregation Roll of Honour also includes names of those who served during World War 1. The combined lists show 12 x Gallantry awards: 3 x Military Cross, 1 x Air Force Cross, 1 x Distinguished Conduct Medal, 1 x Distinguished Service Medal and 6 x Miitary Medals. The names appear, in alphabetical order, on the 'They also served' page.